Scope R4 Rims - Outstanding Allrounder - The Scope R4 is the rim that can do it all. It’s light enough for serious climbing while the 45 mm height provides adequate aerodynamics. 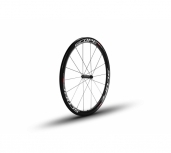 As a result of the shape of the rim the R4 is insensitive to crosswinds. This is the rim with which you can win a time-trail, bunch sprint, and power through on a steep climb. Aero and Tubeless - Computational Fluid Dynamics are used iteratively in order to reduce the drag and crosswind influence from all angles, while benchmarking and outperforming other premium brands. The tire bed of the rim is optimized for tubeless tires while being compatible with all clincher tires The internal width of the rim is 19 mm, when mounting a 25 mm tire the actual tire diameter will become 26 mm thereby perfectly joining the sidewalls of the rim. Finished with 2 layers of tubeless rim tape.